A glass railing mounting system which consists of a shallow, discrete aluminum profile, ideal for small balconies, but can be easily modified and installed in a diverse range of other applications. Perfect finishing, contemporary design, unobstructed view, while ensuring a sturdy and robust structure, compliant with all safety regulations. It is a mounting system without vertical support columns, employing a 70x60mm aluminum profile for the construction of glass railings fixed on the floor οr a parapet. 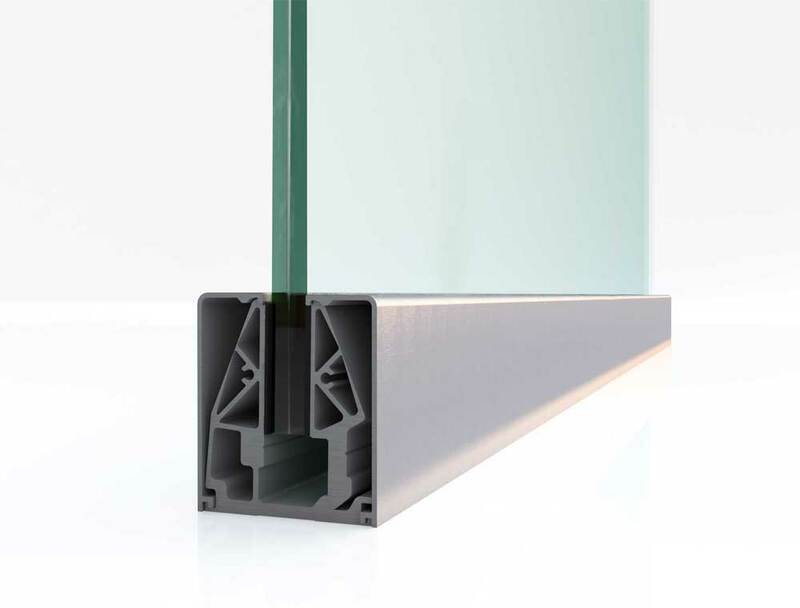 It supports a vertical uniform 10-12mm laminated or tempered laminated glass-board. which can be either transparent or bear a handrail, without any holes and notches. The replacement of the glass-boards is easy, and does not cause damage to neither the floor nor the system itself. The end crystal’s height can reach a maximum of 60cm, while with the addition of a heavy type aluminum (1,89Kg/m) or stainless-steel handrail, it can reach 100cm in height. The glazing can have a special finishing or bear aluminum handrails. The mounting base can be covered with aluminum caps of oval and rectangular shape, which can be anodized (natural anodization or stainless-steel imitation) or electrostatically painted in any RAL color. Mounts are detachable, made EN AW 6060 T66 aluminum alloy and anchored in at specified distances from each other onto stable ground with M8 metal plugs. Used to form glass parapets on balconies or wherever else a glass railing may be required. An impressive effect can be achieved with a LED tape positioned inside the mounts, allowing light to travel through the glass and dispersed at its edges, while the surface retains its transparency. Innovative design : Glass-board support only by using a metal mounting base, without needing vertical support columns, which constitutes one of our company’s most important patents (Patent number: 1006675). Minimalistic aesthetics : Design which maximizes the glass surface and offers an unobstructed view, since the glazing is supported and secured solely by the mounting base, without requiring any vertical support element of additional metal fitments.